On one of our home visits, we met a woman, Sabah. 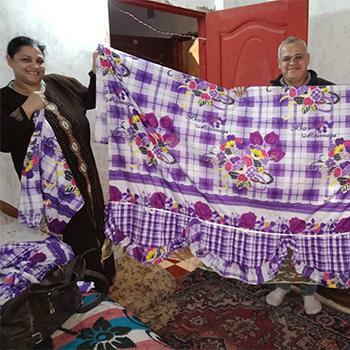 She shared with us the following: "I did not know how to use a sewing machine and my family has been suffering from a very weak financial condition. However, after receiving the sewing machine at the end of the training, I excelled working on it and I can now professionally make bed sheets. The proof of what I say is that there was a competition of nongovernmental and community-based organizations in Ezbit el Amir to choose the best women’s products. I won the first place because of my product--a full set of bed sheets! People were very impressed with my work and this has led to an increase of income for my family. I really thank you for that."